Share your honest opinion about a product you use every day. Help others find the perfect software fit. Everyone uses software from top executives to the star intern. See if you can find the software you use. Want to make a difference in a different way? Leave a review and we'll donate $10 to one of our favorite charities. If we discover attempts by vendors to manipulate their reviews, we may issue alerts to warn users about this behavior. Actions that trigger these alerts include, but are not limited to, soliciting only positive reviews, threatening reviewers with legal action, and writing fake reviews from a shared IP address. G2 Crowd’s Buyer Alerts program is designed to notify users of vendors that have attempted to manipulate the reviews on their profile. 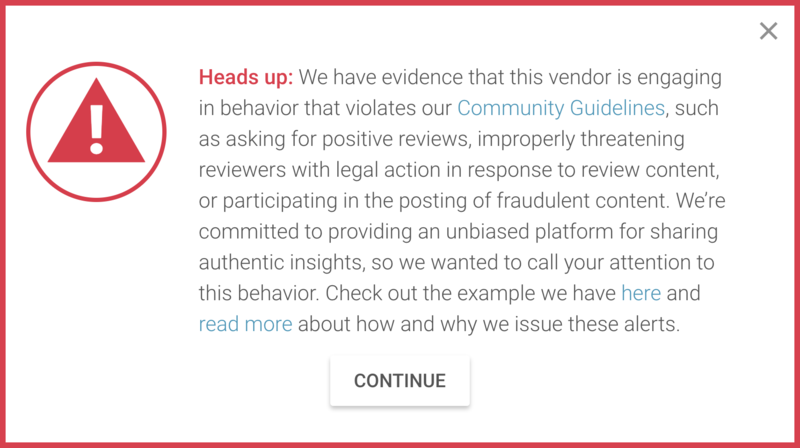 While our moderation team works to make sure the reviews and rankings on our site are accurate, we sometimes encounter cases where we find vendors taking actions that jeopardize that accuracy. Soliciting only positive Reviews. Vendors are not allowed to ask explicitly for positive reviews from their customers. We monitor the messaging vendors use to drive reviews to ensure they’re asking for authentic, balanced feedback. Threatening reviewers. We do not tolerate vendors that threaten legal action against reviewers who leave honest feedback about their product. G2 Crowd works closely with users editing or requesting to remove their reviews to understand their motives. Inquiries about our Buyer Alerts program or the actions taken when those guidelines are violated can be sent to outreachteam@g2crowd.com.